After a brief pause in the decline of Comex Gold inventories, it looks like it has continued once again as there were several big withdrawals over the past few days. 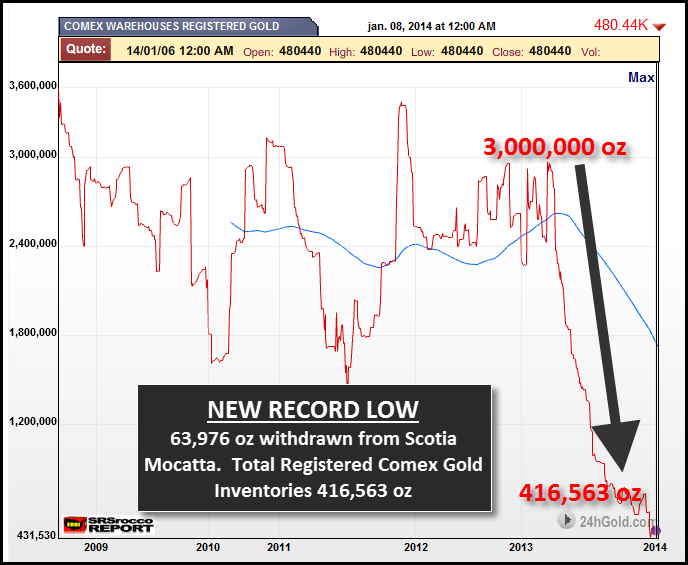 Not only was there a large removal of gold from the Comex today, the Registered (Dealer) inventories are now at a new record low. Scotia Mocatta had 63,786 oz of gold withdrawn from its Registered category. This is quite significant as Scotia Mocatta's total Registered gold inventories fell 41% in one day from 152,409 oz to 88,532 oz. Furthermore, you will notice that the total Registered gold inventories are now down to record low 416,563 oz. The gold in the Eligible category is held by Customers at the Comex while the Registered inventories are the Dealer stocks. A day prior to this update, there was 52,539 oz of gold withdrawn from JP Morgan's Eligible category. We can see just how much the Registered inventories have fallen since the take-down in the price of gold in April of 2013. The Comex held nearly 3 million oz of gold in its Registered category, but today it has fallen 86% to 416,563 oz. The figures in this chart from 24hGold.com do not reflect the drop of 63,976 oz from the Comex today. As you can see, the bottom left hand corner of the chart only goes down to 431,530 oz. 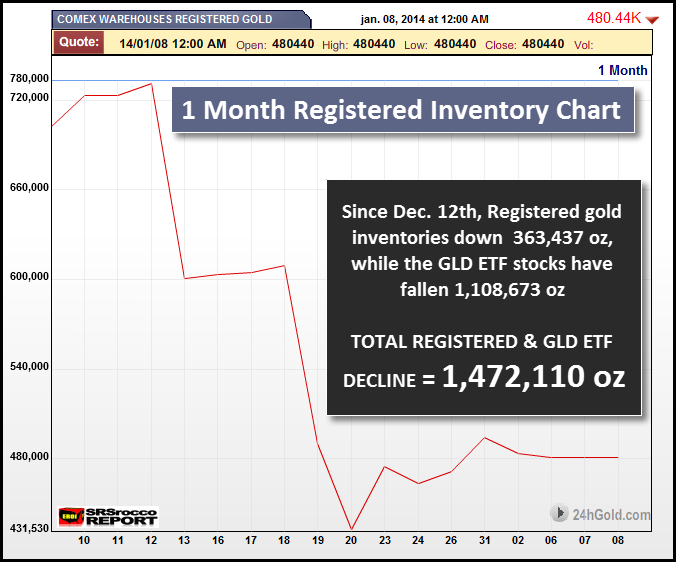 According to the 1 month Registered gold inventory chart, there has been a huge draw-down since Dec. 12th. From a peak of 780,000 oz on Dec. 12th, the Registered inventories have declined 363,437 oz (46%). In addition, the GLD ETF has shed 1,108,673 oz from its inventories in the same time period which puts the total decline for the Comex & GLD stocks since Dec. 12th, at 1,472,110 oz. It looks like a great deal of gold is still heading East as the West continues to live on borrowed paper time. 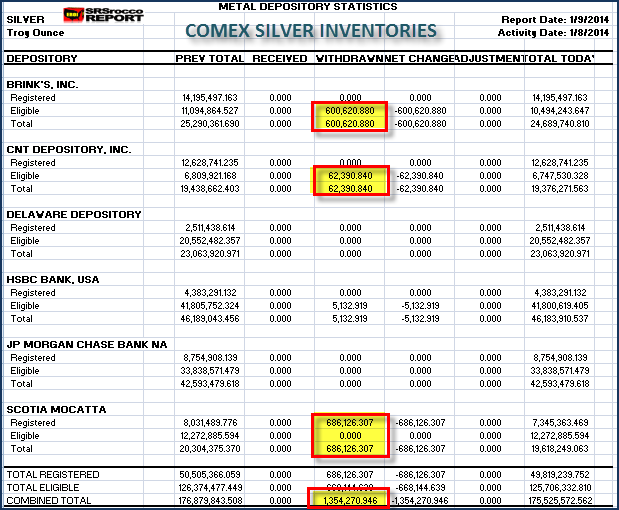 It has been a while since we have seen a large withdrawal of silver from the Comex. 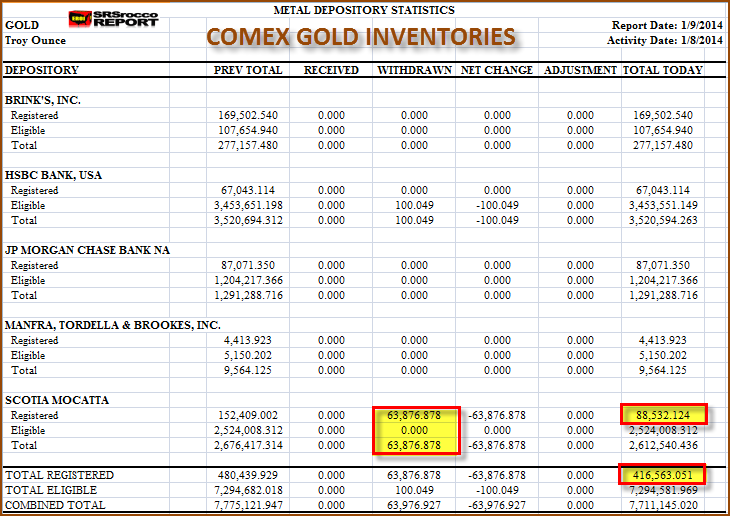 Since Sept. 2013, inventories at the Comex have seen a steady build from 161 million oz. to nearly 177 million oz. However, there were two large and one small withdrawal from the Comex silver inventories today which totaled 1,354,270 oz. Some analysts see the build in Comex Silver inventories as a bearish outlook for price in the future. While we have seen a substantial build in total silver inventories at the Comex, the majority of it has been in the Eligible (Customer) category. From May of 2011 when the price of silver reached its peak, Comex silver inventories hit a low of 86 million. Today the total is 175 million. Despite the large build in Comex Silver inventories, this will not be detrimental for the price going forward when we consider upcoming positive factors in the silver market. This will be discussed in my next article, INSTITUTIONAL BUYING: The Coming Silver Game-Changer... coming this weekend at the SRSrocco Report. IMPORTANT UPDATE: In the next few weeks I will be adding a new section at the SRSrocco Report site called the REPORT PAGE. On the Report Page, there will be Free & Paid Reports. These Reports will be on various subjects including the Precious metals, Mining, Energy & the overall Economy. I mentioned a few weeks ago that I was going to put out a BOMB-SHELL that may change many previously held assumptions. I still plan on putting out that report, however it will be part of a U.S. & GLOBAL COLLAPSE REPORT that will be my first Paid Report.